This range of domestic appliances are suitable for all coffee lovers who likes to prepare their own espresso early in the morning or during the whole day whithout leaving home. 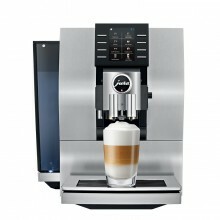 So easy to use you don't need any qualification or abilities to make a cup of espresso in seconds. Perfect for all coffee lovers. You may choose between new or used equipments, according to your current needs or budget. Home coffee machines There are 9 products. 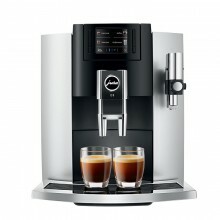 In this section we offer brand new espresso machines for domestic use, machines of last generation and tehnology; over the years we have refined our catalogue of machines to make sure we only offer a selection of the best coffee machines available. Nevertheless, trading brand new machines is not our core business, so we supply them only on demand, delivery taking up to 30 days time. Most of the machines from this section are not cleaned and unrevised and will be sold 'as they are'. No warranty is given. For our very low prices we are not offering reparation and setting service included in the standard price, but we can carry on this job at extra cost, usually 75-125 euro/unit. 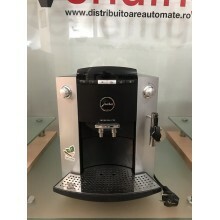 By their nature, used coffee machines can vary in quality and price; however, when cost is paramount, these equipments can offer a good alternative solution. 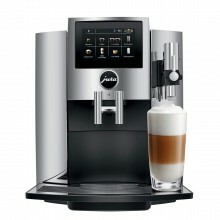 Jura A1 coffee machine, black colour, recommended for domestic use for up to 10 servings / day. No VAT included. 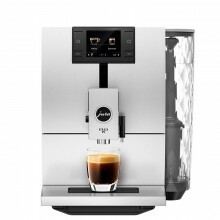 Jura Ena8 coffee machine, silver colour, integrated 2.8” TFT display, recommended for domestic use, offices or locations with a consumption of approx. 15-25 servings / day. No VAT included. Jura E8 coffee machine, platinum colour, TFT display, recommended for domestic use, offices or locations with a consumption of approx. 30 servings / day. No VAT included. Jura S8 coffee machine, silver colour, integrated 4.3” high-resolution colour touchscreen, recommended for domestic use, offices or locations with a consumption of approx. 30 servings / day. No VAT included. 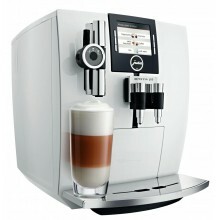 Jura J6 coffee machine, white colour, TFT colour display, recommended for domestic use, offices or locations with a consumption of approx. 35 servings / day. No VAT included. Jura Z6 coffee machine, silver colour, TFT colour display, recommended for domestic use, offices or locations with a consumption of approx. 40 servings / day. No VAT included.